I don't know about where you are, but this time of year, it's really hot in Austin, Texas. You don't have to worry about hot coals; just try the sidewalk. 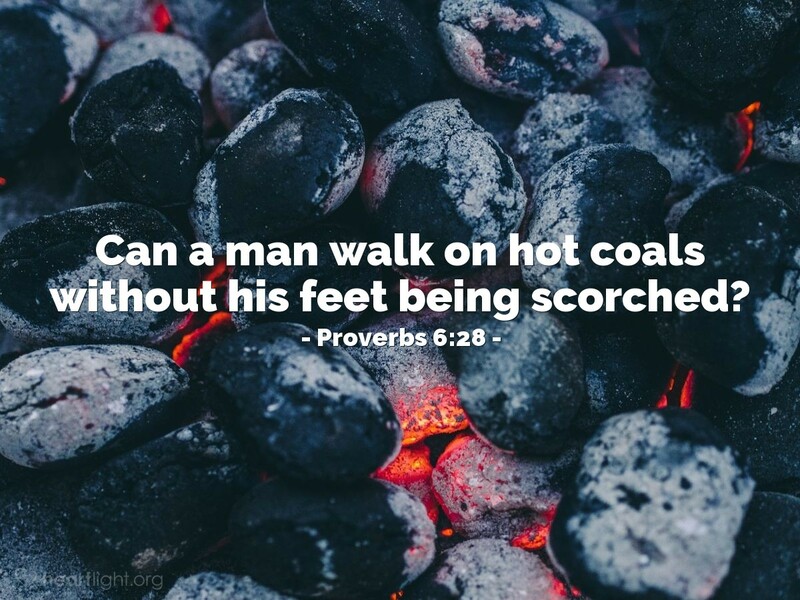 But this reminder about scorching coals is sure good for me. We get to feeling so strong inside spiritually, or we get seduced by a "favorite" temptation, and we decide we can flirt with what is sinful. But the Holy Spirit reminds us through the Wise Man that when we flirt with evil, we're eventually going to get burned. Almighty God, loving Father, and tender Shepherd, please forgive me. I confess that sometimes I allow myself to flirt with what is not wholesome, right, and holy. Thank you for delivering me so often from my stupidities in this area and bless me with strength and renewed conviction as I seek to offer myself fully and completely to you and as I seek to flee what is dangerous and sinful. In Jesus' name. Amen.